In the midst of a tight playoff race, the Milwaukee Brewers aren’t fooling around when it comes to underperforming players. On Thursday, the team demoted closer Corey Knebel to the minors. One year after being an all-star, Knebel has had a dreadful season that has taken a turn for the worse in August. His demotion opens a roster spot for the Brewers to activate Joakim Soria from the DL on Friday. Knebel amassed 39 saves while posting a 1.78 ERa in 2017. The Brewers were banking on him being the same dominant closer again this season. But that has not been the case. Knebel currently has a 5.08 ERA with just 14 saves. Since the all-star break, his ERA is 7.24, and things have been worse recently. Over his last five outings, he’s allowed eight runs over 3.1 innings. Finally, enough was enough for the Brewers. Josh Hader and Jeremy Jeffress have both seen action in save situations since Knebel was removed from his post earlier this month. But with Knebel continuing to spiral in low-leverage situations, the team had to do something to get him back on track. Counsell hinted that confidence has become part of the problem with Knebel. The Brewers are hopeful that a stint in triple-A can help Knebel get his confidence back. Counsell says the club is “searching for answers” when it comes to their one-time closer. Sending him to the minors seems to be a last resort for the struggling closer. Even with Knebel having a poor season, the Brewers have had one of the best bullpens in the National League this season. It’s been one of the biggest strengths of the team and an important reason why the Brew Crew is in the playoff race heading down the stretch. Milwaukee is currently 3.5 games behind the Cubs in the NL Central and tied for the second wild-card spot with the Rockies. Without Knebel, the trio of Soria, Hader, and Jeffress figure to do most of the heavy lifting at the end of games. Dan Jennings and Taylor Williams are also having solid seasons in the Milwaukee bullpen. Of course, the Milwaukee bullpen would be even better if the team can get Knebel back on track. 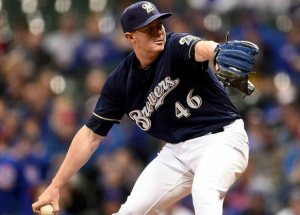 If Knebel can get his problems sorted out and return to the team in September, he still has a chance to make a difference and help the Brewers secure their first playoff birth since 2011.